Despite the lengths “tuners” from Fast and Furious franchise went, it seems they hadn’t reached the level of tuning outrageousness we have in this world. Not even scratched it. Look at this thing. It is a BMW E36 M3. A fine car without the mods for sure, but this particular is more of a gimmick, a clown or just an extreme interpretation of what can happen in the tuning world if someone had one (or seven) too many. BMW M3 E36 listed for sale on UK eBay for 15,000 British pounds (20,000 euros) features a full custom body kit. 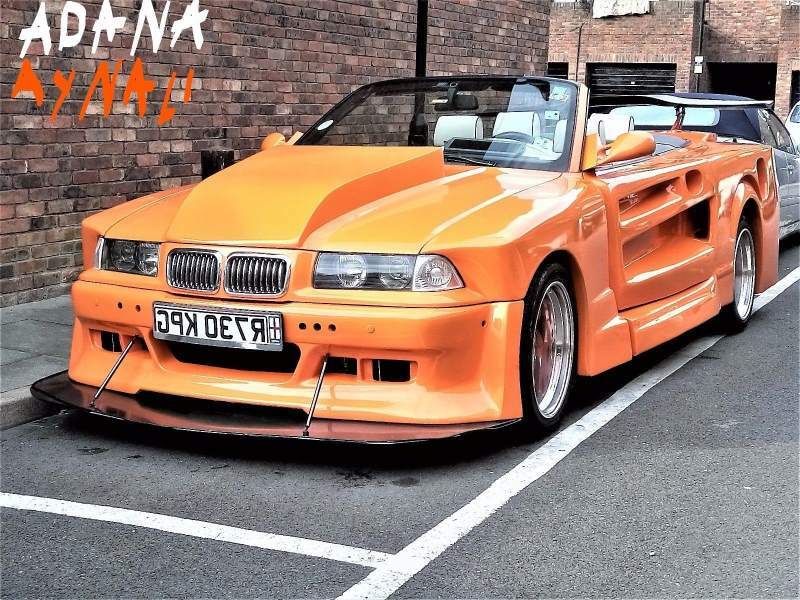 It’s massive orange slab of hideously shaped plastic almost hid all the styling features of once clean and rather refined E36. Instead of the clean, simple, almost aristocratic lines, this 1998 BMW M3 E36 Convertible has custom rear lights. At least twice the size of the original lights. Massive rear bumper widens the car making it impossible to fit in a normal parking space. The front isn’t any better either. It is super wide and with that splitter the size of a plow, I do not see it actually being able to overcome all the bumps on the roads.